Gallerie Gallera is an art gallery and studio which is on the main floor of Pointe aux Pins Lodge, now known as “That Canadian Lodge”. It is located on a tranquil and secluded island in the heart of the Ottawa River. We provide a space for artists to pursue their art while developing their skills. Read on to see what’s new for summer 2016! This year’s focus will be on floor cloths and the Dumoine River. I have done a number of drawing and paintings and have them on view. There are new floor cloths created in traditional style and others created using today’s more vibrant colors that grace the floor of the gallery. Framed illustrations from the children’s book, “Fang, Grandma’s Prized Cat” written by Muriel Davies done in soft watercolor by Tina. I will also be giving a workshop at the Stone School Gallery in Portage du Fort, Quebec, on August 22 -23 for those closer to Ottawa. Showcasing a sample of “Decorative Chairs”, a fund raiser to be held again in 2017 to raise money for the Pontiac Artists Association…..information regarding the chair auction will be posted as soon as i receive it. Tina Michaud (me) is offering a workshop “Art You Can Walk On” at Gallerie Gallera. 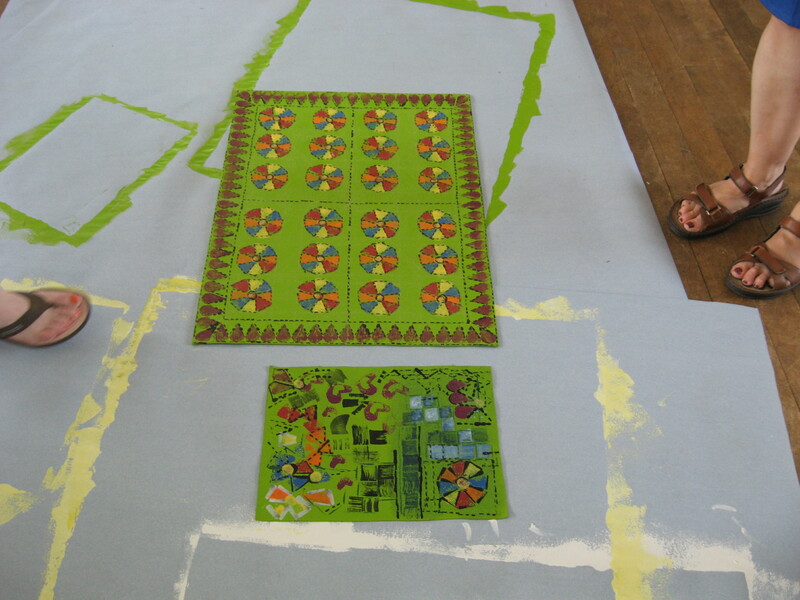 Participants will be creating a floor cloth of their own design from beginning to end….taking it home ready to grace the floor. Accommodations will include continental breakfast. I am offering this workshop at the Pontiac School of the Arts. Participants will be creating a floor cloth of their own design from beginning to end….taking it home ready to grace the floor. 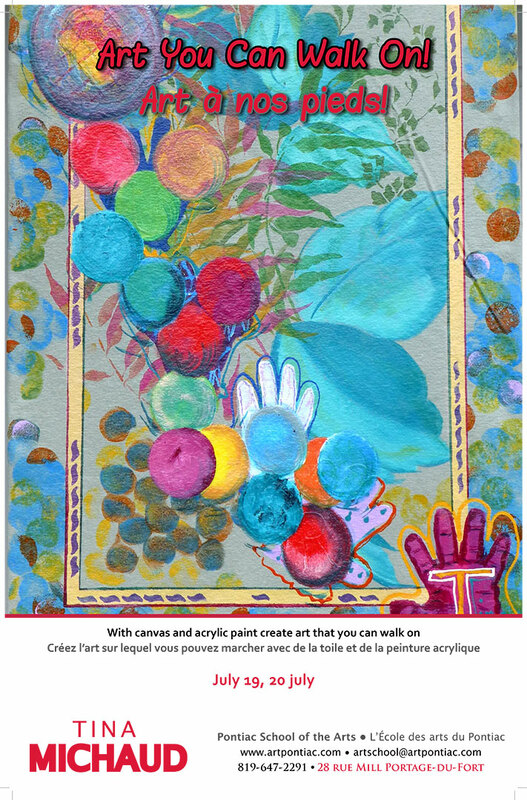 Joyce Burkholder is offering her Adventure Painting workshop which will include oil, acrylic and watercolour together in a three day workshop on Tuesday, Wednesday and Thursday, August 2-3-4, 2011. Joyce will be exploring the island to capture its beauty on canvas and teach students to recognize and interpret these images through their own creative expression. The studio will be available in the event that the weather does not cooperate with outdoor painting. Date: Tuesday, Wednesday and Thursday, August 2-3-4, 2011. Time: Beginning at 1:00 p m to 3 p m on Tuesday with a demonstration by the artist in the evening in the studio. The workshops will continue for two full days on Wednesday and Thursday, from 10:00 a m to 3:00 p m , capturing scenes from nature on this beautiful island. Cost of stay: $135 (shared accomodation) $170 (single). Accommodations will include room, continental breakfast and dinner. 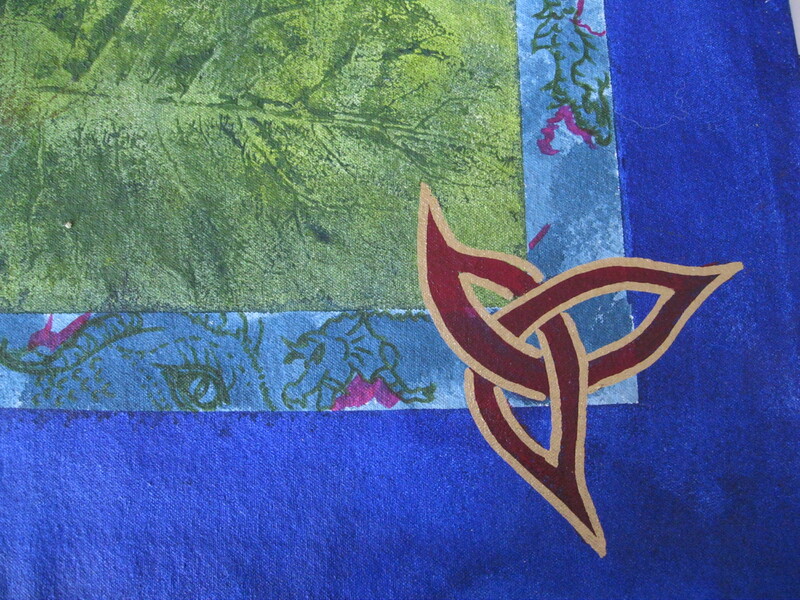 Tina Michaud (me) is offering a workshop “Art You Can Walk On” held July 2-3-4. Participants will be creating a floor cloth of their own design from beginning to end….taking it home ready to grace the floor. When creating floor cloths Tina helps people tap into their creativity while discovering their soul’s expression using a “no-rules” approach. You can then take it home and walk all over it! The studio, with its four large windows overlooking the river, by day, allows natural light to illuminate the space. The studio offers a wonderful view of the natural reserve across the river and any number of birds who inhabit this unspoiled region. Watch for these notices if you are interested in joining us or email me, Tina Michaud. I’m here for you! Over the past three years the gallery has been available for artists to hold exhibitions of their work. I have been encouraging “new” artists to use the gallery to begin their process to expose their work ( framing, produce business cards, bios, naming and pricing their works) and to date 14 artists have used the space.